The growing ranks of property owners in the Texas Hill Country now have a new tool to help them manage their land well. In the Hill Country Landowner's Guide, author Jim Stanley charts a practical course for understanding and handling a variety of problems landowners will confront: brush control, grazing, overpopulation of deer, erosion, fire, and exotic animals and plants. He also explains why and how to encourage the growth of native grasses and woody plants, the presence of songbirds and other native wildlife, and the health of trees and conservation of water. 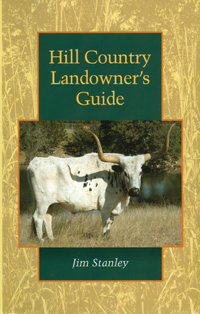 Filled with advice that landowners can easily absorb and implement, this book conveys basic knowledge the author has gained from experience and experts during his years in the Hill Country. Both new and established landowners will want to add this book to their libraries of nature-related and land management references.